No hugs. Give me the baton! Excuse me! I'm sleeping here. Don't bother me. I'm resting. The GGRW course boasts the largest number of tourist destinations of any walk. 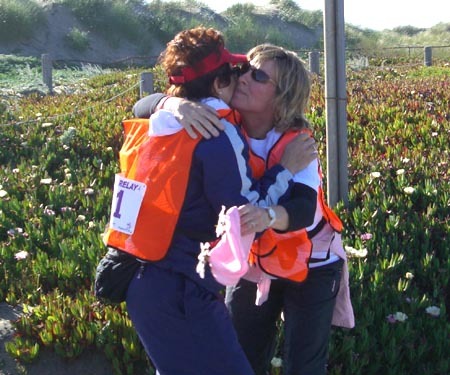 From Marin, teams travel through 28 cities, across the Golden Gate Bridge to the ocean in Santa Cruz County. The 125 mile course is divided into 24 legs so each team member walks twice. Leg: one of 24 (3-7 mile) segments of the 125 mile course. (Also, one of two appendages used for walker propulsion.) Walk Legs are numbered 13-36 (and not 1-24 to avoid issues with emergency responders, volunteers and permit providers). Competitive Teams must follow all Rules: walkers must walk every 12th leg (Walker 1 walks Legs 13 and 25) and maintain the order (1-12) submitted on the Roster/Waiver at the start. If a walker is injured, the next walker in rotation must substitute and others move up (Rules 19, 20). If a walker drops out, walkers 1 and/or 2 will walk an extra leg. To qualify as winners, submasters and masters teams must submit a copy of each walker's driver license at the Start. 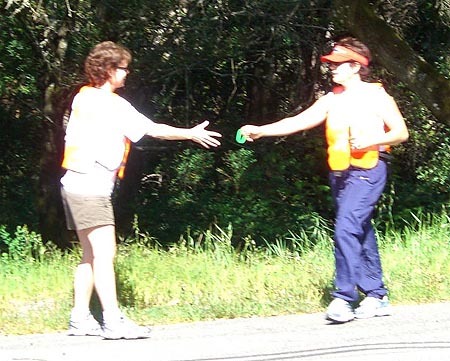 Exchange: one of 21 locations where a walker hands the baton to a teammate in the same van. Only Active Vans (waiting for an incoming walker), may park in Exchanges. While the Active Van is completing six legs, six walkers in the Resting Van can	shower, eat, rest and play. To reduce congestion, Resting vans may not park in Exchanges or drive along the course, but must follow Resting Van Routes. Van Exchange: one of 3 locations (18, 24, 30) where a walker hands the baton to a teammate in the other van. Since one van finishes and the other van begins, Active and Resting vans may park in Van Exchanges. Vans, Active/Resting: The Active Van transports walkers (usually five) to the next Exchange while a teammate is walking. The Active Van must carry supplies (there are no aid stations) and may not trail walkers, but must drive ahead to ready the next walker. Vans may not obstruct the shoulder forcing walkers into traffic. Resting vans may not park in Exchanges or drive along the course, but must follow Resting Van Routes. ASSIGN WALKERS 1-6 to Van 1 and Walkers 7-12 to Van 2. Van 1 will be the Active Van on Legs 13-18 and 25-30. Van 2 will be the Active Van on Legs 19-24 and 31-36. When assigning legs, review the Course Summary Table. Walkers spend the race with teammates in their own van and see walkers in the other van for brief periods at Van Exchanges. Driving the course in advance at night will facilitate navigation during the race. Captains may calculate Van Exchange times by using pace estimates of walkers. To reduce vehicle congestion, Resting Vans must travel Resting Van Routes to the next Van Exchange (18, 24, 30). Resting Vans that travel along the course or park in Exchanges will be penalized. 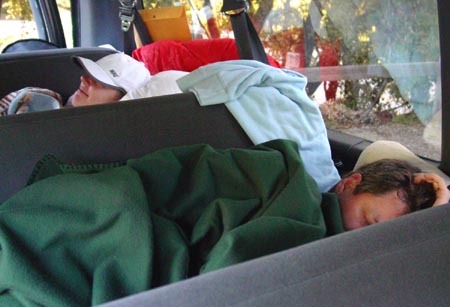 Consider the following strategies for Resting Vans. Facilities/Supplies Food may be purchased at the Start, Exchanges 15, 16, 20, 24, 25, 27, 32, 33 and Finish. Gas is available at Exchanges 15, and 25. Since Canada College is rebuilding the gym, showers are no longer available at Exchange 24. Start Van 1, with Walkers 1-6, begins in Marin. Van 2, the Resting Van, with walkers 7-12 is not required at the Start and may proceed to the 1st Van Exchange (Exchange 18), Golden Gate Bridge, to ready Walker 7. 1st Van Exchange (Exchange 18) After Legs 13-18, Van 1 walkers may enjoy San Francisco and then proceed to the 2nd Van Exchange (Exchange 24), Canada College via Van Route 2 to shower, rest and eat (breakfast served from midnight to 9 am). 2nd Van Exchange (Exchange 24) After Legs 19-24, Van 2 walkers may shower, rest and eat at Canada College and then proceed to the 3rd Van Exchange (Exchange 30), Hwy. 9 at Hwy. 35, via Van Route 3. 3rd Van Exchange (Exchange 30) After their last legs (25-30), Van 1 walkers must travel Hwy. 17 to the Finish in Santa Cruz via Van Route 4. Walkers should join their final teammate and finish as a team.